For the electoral district, see Cambridge (electoral district). 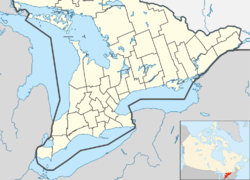 For the former township in Ontario, see Cambridge Township, Ontario. A fine place for business, a great place to call home. In the late 1700s, developers began to buy land around the Grand River from the Six Nations Indians who were led by Joseph Brant. One speculator, William Dickson, a wealthy immigrant from Scotland, bought 90,000 acres (360 km2) of land along the Grand River in 1816; this was later to become Galt and the Dumfries Townships. Dickson divided the land and sold smaller lots, particularly to Scottish settlers. The centre of the planned community was at the junction of Mill Creek and the Grand River, then called Shade's Mills. Dickson decided to name the Post Office Galt, in honour of John Galt of the Canada Company which was developing this entire area. Primarily agricultural in early years, Galt had attracted industry by 1840 and became the largest town in the Grand River area until the early 1900s. The town continued to grow, however, based on a large industrial base. In fact, Galt was called "Manchester of Canada" because of the extensive industry, powered by the Grand River. Some of the important businesses in about 1870 included the Dickson Mills (opened in 1843), the Axe Factory forge, two furniture factories, The Dumfries iron and brass foundry, three large woolen factories, a malt factory, the Victoria Steam Carriage Works, the Dumfries Flour Mill, the Victoria Foundry making farm implements, a large soap and candles works and two steam-powered tanneries. Records from 1846 indicate that Galt had very valuable water-power that allowed for milling and manufacturing. Stone buildings in the downtown area had already been erected and the population was 1000, most originally from Scotland. Amenities included a curling club, library, a weekly newspaper, a school, a bank (Gore) and a fire company. The post office was receiving daily mail. Industries included two grist mills, two saw mills, two foundries, two carding machines and cloth factories, one brewery, two distilleries, one tannery, eight stores, nine taverns, two grocery stores and various tradesmen. The largest of the early schools in the community, the Galt Grammar School, opened in 1852 with William Tassie as headmaster starting in 1853 at the site of what later became the Galt Collegiate. The school gained widespread recognition and attracted students from across North America. By 1872, it had been recognized as a Collegiate Institute. Galt was incorporated as a town on January 1, 1857, with Morris C. Lutz elected as the first mayor. By 1858, a "Town Hall and Market House" had been built with an "Italianate", particularly Tuscan, influence. In later years, the building became the City Hall and was extensively modified. Galt was incorporated as a town in 1857. Throughout that entire period, it continued to grow based on a large industrial base. An interurban streetcar connected Hespeler to nearby Preston and Galt. The railway reached Galt in 1879, increasing the opportunities of exporting local goods and importing others. The Credit Valley Railway planned to implement several lines running west and north from Toronto and in 1873, built freight and passenger buildings in Galt. By 1879, the company had installed a bridge crossing the river and in December completed a preliminary test run with a train; it was successful. The CVR venture was not long-lived however, and in 1883, the line was taken over by the Canadian Pacific Railway which built a brick passenger building that still stands. The first hospital in Waterloo County opened in 1890 as Galt General Hospital. Additional buildings and facilities were added in the early 1900s. By 1918, the facility had an X-ray room, a 27 room nurses' residence and was also a nurse training school. A new streetcar system, the Galt, Preston and Hespeler electric railway, (later called the Grand River Railway Company) also began to operate in 1894, connecting Preston and Galt. In 1911, the line reached Hespeler, Berlin (later called Kitchener) and Waterloo; by 1916 it had been extended to Brantford/Port Dover. The electric rail system ended passenger services in April, 1955. Galt was incorporated as a city in 1915 and continued to grow based on a large industrial base. In 1911, most of the population of Galt were Protestant: 4,240 Presbyterians, 1,930 Anglicans, and 2,122 Methodists. There were very few Roman Catholics. Not long after Galt had become part of Cambridge, in May 1974, flooding on the Grand River filled city streets with water to a depth of about four feet. In some areas of the downtown core, the depth was 17.4 feet, smashing windows and carrying goods along the streets. Approximately 75 businesses were affected, with virtually none covered by relevant insurance. The flood caused an estimated $5 million in damage. An interurban streetcar connected Preston to neighbouring towns. Preston was formed on land belonging to the German Company Tract, along the Speed River, which was purchased earlier from the Six Nations Indians. The name Preston is from the hometown of William Scollick, who was surveyor and a native of Preston, Lancashire in England. In the 1800s a group of German-speaking Mennonites from Pennsylvania arrived in the area and purchased land. Among the first settlers to arrive in what was later to become Preston was John Erb, a Mennonite from Lancaster County, who arrived in 1805. He bought 7,500 acres (30 km2) including land at the confluence of the Grand and Speed Rivers in what later became Preston. It was John Erb who bought the 7,500 acres (30 km2) of land and settled it in 1805. He later built a sawmill in 1806 and a gristmill in 1807. This settlement became known as Cambridge Mills. Even in the early 1800s, the area included homes, a store, an inn, small shops operated by artisans and craftsmen, mostly immigrants from Germany. The Erb sons had hired William Scollick for their development business and the latter completed a full survey in 1834; he also convinced the Erbs to rename the Cambridge Mills area Preston. After Erb's death in 1832, a son sold off property on both sides of the Speed River. What eventually became Preston started as a large settlement on the north side. There were only 250 inhabitants in 1836, many from Pennsylvania, but the population had reached about 1600 by 1855, with some 70% originally from Germany. By then, the area had eight hotels and taverns. The Canadian Gazetteer of 1846 indicates a population of about 600 inhabitants, two churches, a post office that receives mail each day, a steam grist mill, and tradesmen of various types. At the time, there was no significant industry. The Preston post office opened in 1837 and the population continued to grow primarily because of immigration from Germany. Preston was incorporated as a village in 1853. The population declined in the late 1800s but by 1900, it had increased to 2,000 partly because of the new electric railway systems that started in 1894. In 1911, the line reached Hespeler, Berlin (later called Kitchener) and Waterloo; by 1916 it had been extended to Brantford/Port Dover. This made visiting other communities and carrying of goods very convenient. Due to continued growth, by 1879 there were many industries such as a foundry, carriage manufacturer, potteries and a furniture company. This was also the year that the Cherry Flour Mills started, which would later become the Dover Flour Mills, a Preston company that still operates today. By 1888, the Preston Springs Hotel, then called the Del Monte Hotel and owned by Robert Walder, was operating. The building still stands (but is vacant). In the late 19th century, it featured five acres of grounds with gardens and lawns. The primary draw was the mineral baths in the hotel's basement, said to "cleanse" the body. The high sulphur content was believed to be useful for those with arthritis and rheumatism. A competing facility, the Suplphur Springs Hotel, next door, opened in the mid 1890s, and a nearby hotel, the North American (renamed the Kress Hotel in 1900), had opened in 1840. Walder sold the Del Monte in 1903; a later owner, A.R. Kauffman, renamed it Preston Springs, and the facility remained successful as a health spa until 1940. After the war, it closed for some years, eventually becoming a retirement and care facility, until closing in 1990, when the building was boarded up. In 2000, some exterior repairs were completed but work stopped when the cost became excessive. The owner in mid-2018 was Haastown Holdings Preston Inc.
On September 30, 1899, Preston was incorporated as a town with a population of just under 11,000. The Great Road between Dundas and Berlin (Kitchener) as well as the railroad connections helped the community to continue growing into an important industrial centre. Products made here included flour, agricultural implements, furniture, stoves, shoes and textiles. Preston grew and continued to be a successful industrial area; expansion followed in the 1950s and 1960s. While most of the population of what became Waterloo County, Ontario was Protestant in 1911, Preston had a larger share of Roman Catholics, 844, while 862 were Lutherans, 707 Methodists, 704 Anglicans, and 525 Presbyterians. The area that eventually came to be Hespeler was also on land (Block 2 measuring over 90,000 acres (360 km2) purchased in 1798 by Mennonites from Pennsylvania from the Six Nations Indians with the assistance of developer Richard Beasley. The first of settler, in 1809, was Abraham Clemens who had bought 515 acres (2.1 km2) of land from Mr. Beasley on the Speed River. In 1810, Cornelius Pannabecker arrived and set up a blacksmithy a year or two later. Twenty years later, Joseph Oberholtzer purchased a much larger area of land that would become the early Hespeler. It was named Bergeytown in honour of his brother-in-law and the name became New Hope in about 1835. Settler Jacob Hespeler arrived in 1845 and bought a 145 acres (0.59 km2) tract on the Speed River. He built an industrial complex that was the beginning of Hespeler's future industrialization which would consist primarily of woollen and textile mills. Records from 1846 indicate a population of only 100 inhabitants, a grist and a saw mill, a tannery, a tavern, one store, one pail factory, two blacksmiths, two tailors, two shoemakers. In 1858, Jacob Hespeler opened the Post Office and the settlement, previously called New Hope, was incorporated as the village of Hespeler. The arrival of the railway in 1859 helped businesses to develop and prosper. By 1864, there was a large flour mill, cloth and wool manufacturing plants, a sawmill and a distillery all built of cut stone. There was also a large furniture factory and four churches. Continued growth allowed Hespeler to be incorporated as a town in January 1901. Over the following years, the community continued growing slowly. By 1911 the electric railway system between Preston and Galt had reached Hespeler as well as Berlin (later called Kitchener) and Waterloo; by 1916 it had been extended to Brantford/Port Dover. Textile production mills were the primary industry in the early 1900s and continued to be successful until the late 1940s, when this industry began to decline. Other industry continued to boom and by 1969, Hespeler's population was 6,000. The land (west of what is now Preston), including Carolinian forest, that would eventually become Blair was purchased from the Six Nations, through land speculator Richard Beasley. It was settled in 1800 by Samuel D. Betzner, one of the Mennonites from Pennsylvania. The group later discovered that Beasley had gotten into financial trouble and that a lien was placed on the lands. To solve the problem, the group created the German Company that bought an additional 60,000 acres of land from Beasley who used the proceeds to pay off the debt on the previous lands. This ensured a clear title for the Mennonite group. By 1804, the first cemetery in Waterloo County had been founded. Located in Blair, it is often referred to as the Old Blair Cemetery or the Old Blair Memorial Cemetery. The first recorded burial was of an infant, the son of Mennonite settler John Bricker, who died on March 10 of that year. Joseph Bowman, a man called Wismer and John Bechtel were responsible for the early development of the community in an area laid out by Benjamin B. Bowman. They built a dam and then a sawmill and grist mill. In 1846, a large flour mill called the Bowman Mill, Blair Mill and also the Carlisle Mill opened. In about 1876, a 15-horsepower hydroelectric system, the Sheave Tower, was built on Bowman Creek by Allan Bowman to help power the flour mill using a series of shafts and gears. This was a significant achievement in that era. Although the name Carlisle (or New Carlisle) was commonly used then, the name Blair was chosen for the first post office in 1858 because a village of Carlisle had already been established in Halton County. The new name honoured Adam Johnston Fergusson-Blair, the first judge of Wellington District and a militia colonel in the area. In addition to Carlisle, earlier names for the village had included and Shinglebridge, because a bridge with a shingle roof crossed the Grand River in this area from 1853 to 1857. It was called the Durham or Durhamville and Lambs' Bridge. By 1864, the settlement was receiving mail daily, had a large school, a Mennonite meeting house, a large brick church and a population of 200. A railway line arrived at the village in 1873. Blair became part of Preston in 1969. Many historic buildings still stand in the village, including some from the early 1820s. This includes the Sheave Tower (restored in 1999) and the John Bechtel residence. An interurban streetcar connected Hespeler, Preston and Galt. A new streetcar system, the Galt, Preston and Hespeler electric railway (later called the Grand River Railway Company) began to operate in 1894, initially connecting Preston and Galt. In 1911, the line reached Hespeler, Berlin (later called Kitchener) and Waterloo; by 1916 it had been extended to Brantford/Port Dover. The electric rail system ended passenger services in April, 1955. The light rail transit plan for the Regional Municipality of Waterloo, decades later, would be reminiscent of the original Electric Railway. The first mayor of Cambridge, taking office as of the city's creation in 1973, was Claudette Millar. Most recently, Kathryn McGarry was elected in the 2018 municipal election to succeed Doug Craig as the city's sixth mayor, taking office on December 1, 2018. Cambridge City Council consists of the mayor and eight councillors, each representing a ward. Cambridge is also represented on the higher-tier Waterloo Regional Council which consists of the regional chair, the mayors of the seven cities and townships, and eight additional councillors - four from Kitchener and two each from Cambridge and Waterloo. Ken Seiling has held the position of regional chair from 1985-November 30, 2019. In the 2018 Region of Waterloo elections, Karen Redman was elected as Regional Chair. Cambridge (electoral district) is represented in Ottawa by Bryan May (Liberal), the federal member of Parliament who defeated the previous incumbent MP (Gary Goodyear, Conservative – 2004 to 2015) in the October 2015 election.The second federal representative for Cambridge is Marwan Tabbara (Liberal), under the new riding of Kitchener South-Hespeler. The MPP for Cambridge is Belinda Karahalios (Progressive Conservative Party of Ontario), who was first elected to this position in 2018. The second provincial representative for Cambridge is Amy Fee (Progressive Conservative Party of Ontario), who represents the provincial riding of Kitchener South-Hespeler. The city is responsible for Community Services, Economic Development, Transportation & Public Works, Corporate Services, Fire Department and Planning Services. Many municipal services are provided through the Regional Municipality of Waterloo (often referred to as Waterloo Region or the Region of Waterloo), which consists of the cities of Cambridge, Kitchener, and Waterloo, and the townships of Woolwich, Wilmot, Wellesley, and North Dumfries. The region of Waterloo responsibilities includes Social Services, Community Health Services, Grand River Transit and Community Policing through Waterloo Regional Police Service. Hospital services are provided by the city, through Cambridge Memorial Hospital at 700 Coronation Boulevard. A small hospital in the Galt area had opened in 1890, the first in Waterloo County, while the current facility, originally named South Waterloo Memorial Hospital, was completed in 1953. It was expanded in the early 1970s with the addition of Wing B, the inpatient tower. This facility began a $187 million expansion project in 2014 that was expected to be completed by 2019. The hospital summarized the plan as follows in 2013: "This transformation includes a larger Emergency Department and a 33% increase in beds to accomodate [sic] expanded mental health, medicine, surgery, birthing programs and so much more". Difficulties with the general contractor, Bondfield Construction, which eventually went into receivership, delayed the process significantly. A news report on 29 December 2018 stated that "After two decades of planning and community fundraising, the expansion project, promising 54 new beds and a twice-as-large emergency department, is not quite half-complete and stalled". A consortium of banks, led by the receiver, the Bank of Montreal, called on the contractor's insurer (Zurich) to activate its surety bond. That step was expected to provide the funding that would eventually allow the project to be completed, by 2021 at the earliest, according to one estimate. The climate in Cambridge is typical of southwestern Ontario, and has a humid continental climate under the Köppen climate classification (Köppen Dfb) with mostly moderate winters but the occasional deep freeze. In summer, the temperatures tend to be in the high twenties on the Celsius scale, and like most of southern Ontario, there can be stretches of high humidity creating some discomfort. On most days, Cambridge tends to be slightly warmer than Kitchener and Guelph, just to the north. The last frost date of the season is around May 11, though most gardeners plant on the May 24 long weekend to be safe. Environment Canada issues frost warnings for the area from October 30 through to May 9. In 1988, Toyota Motor Manufacturing Canada opened a plant in Cambridge, which employs approximately 4,500 people and is the city's largest employer. Several other industrial companies also have locations in Cambridge, including Rimowa, Gerdau, ATS Automation Tooling Systems, Loblaw Companies Limited, Dare Foods, Frito-Lay Canada (formerly Hostess), Babcock & Wilcox, Rockwell Automation and COM DEV International in addition to service companies such as Coronation Dental Specialty Group. The city encourages the filming of movie and TV productions and many have done location work here. Filmmakers come to the city for the unique European looking buildings and proximity to Toronto. Cambridge has become more "film-friendly" and has an increase in filmmakers coming to the city, with 15 projects filmed in 21 days in 2016. According to an interview with the Cambridge Record, Devon Hogue, economic development officer with the City of Cambridge noted what draws filmmakers: "First and foremost, they come for the river... Once they are here, they fall in love with the built architecture. That's not something you can get very easily in Toronto or Hamilton." In 2016, filming in Cambridge contributed $1.2 million to the economy and Hogue states that: "Seeing Cambridge on the screen creates a sense of community pride." Notable films shot in Cambridge include John Q (2002), Red (2010), Silent Hill: Revelation (2012) and Flatliners (2017). Notable television series filmed in Cambridge include Murdoch Mysteries (2008-), Between (2015–2016), Bitten (2014-2016), 11.22.63 (2016), The Handmaid's Tale (2017-), Designated Survivor (2016-), V-Wars (2019-), The October Faction (2019-) and American Gods (2017-). Galt Collegiate Institute, one of the oldest public high schools in Ontario. Public English-language schooling is provided by the Waterloo Region District School Board, which operates 26 elementary and five secondary schools in Cambridge. Public High schools in the city include the 165-year-old Galt Collegiate Institute and Vocational School; Preston High School, Glenview Park Secondary School; Southwood Secondary School; and Jacob Hespeler Secondary School. Publicly funded Catholic education is available through schools operated by the Waterloo Catholic District School Board. The WCDSB runs 15 elementary and two secondary schools in the city. St. Benedict Catholic Secondary School & Monsignor Doyle Catholic Secondary School. Cambridge is also home to École secondaire Père-René-de-Galinée, the only French Catholic High School in the region. There are also a number of private elementary and secondary schools in the area. The University of Waterloo School of Architecture campus is located in Cambridge in the Riverside Silk Mill, also known as the Tiger Brand Building. Inside there is a theatre, a fitness room, and the gallery "Design at Riverside", which is one of two publicly funded galleries dedicated to architecture in Canada. The School of Architecture is home to 380 students who live, study, and learn within the Cambridge community. In 2009, Conestoga College Institute of Technology and Advanced Learning set up a new School of Engineering Technology specializing in advanced technology programs related to: Robotics, Process Automation, Electronics, Communications, Engineering, and Information Technology. With over 200,000 square feet (19,000 m2) of applied learning and research space. The new Hespeler Library was created by building a glass cube around the historic Carnegie library. The environmentally responsible building features recycled white oak floors and a ceramic treatment on the glass to reduce sunlight intensity. Cambridge is home to many cultural events and activities, including the Mill Race Festival and the Rock the Mill music festivals in downtown Galt. Cambridge also has the Cambridge Highland Games in Churchill Park in July. There's also Cambridge Butterfly Conservatory the annual dragon boat festival, the Cambridge fall fair which has been entertaining locals and visitors alike for over 100 years. The Cambridge Santa Claus Parade was one of the first city parades in Ontario to go to the night-time format. There is also the festive 'Christmas in Cambridge' winter festival at Christmas featuring events like Unsilent Night, which began in New York City by Phil Kline. The City of Cambridge's take on this event uniquely involves other aspects of the community such as Christie digital projection technology. University of Waterloo School of Architecture Cambridge students in Dr. Jeff Lederer's Urban Revitalization and Design class designed the spectacular light installations. The Cambridge Farmers' Market has been in operation in the original building on the original site circa 1830; making it the third oldest market in the country. The Cambridge Farmers' Market is now ranked as one of the top 10 markets in the country by Best Health Magazine. All the vendors come from within a 100 km radius to sell fresh fruits, cheese, vegetables, baked goods and more. The Cambridge Centre of the Arts is a municipally-operated community arts centre that is available to area residents, artists and organizations. The Arts Centre was opened in May 2001. Cambridge Galleries are a part of the Cambridge Public Library system or Idea Exchange, with art exhibition spaces at Queen's Square, Preston and the new Design at Riverside location. Together, the three galleries host approximately 23 exhibitions per year. Along with the art gallery projects, Cambridge Libraries (Idea Exchange) are undergoing a $13.5 million restoration project of a former post-office into a digital library. The building was unused for some time before the city bought it for %950,000 and a Parks Canada grant of $800,000 restored some of the building. The new project will not house physical print but focus on 3D & laser printers, maker labs, performance and studio for teen, a large children's area including a Lego wall and a coffee shop. The Federal and Ontario governments and the City of Cambridge came together and built the Dunfield Theatre in 2013 in an effort to promote Canadian talent and the performing arts. The 59,000-square-foot arts complex boasts 500 seats and over $20 million was contributed/donated. Micheal Chan Minister of Tourism, Culture, and Sport said of the theatre's construction:"Arts and culture help to stimulate the economy, draw visitors to our province and enhance our quality of life...The new Dunfield Theatre Cambridge will enrich the cultural fabric of this community and provide exciting opportunities for people to engage in the arts. The Ontario government is pleased to support such a worthy project." In 2018, the theatre's name was changed to the Hamilton Family Theatre. In June 2008, the new Cambridge City Hall facility opened as the first city hall in Canada to achieve the ranking of gold in the LEED from the Canada Green Building Council. The $30 million project was completed on time and on budget and financed through a settlement of a loan with the city's hydro utility. A conservative estimate comparing a standard 85,000-square-foot (7,900 m2) building to the new City Hall LEED standard building results in a $160,000 savings on energy per year or some $1.6 Million over 10 years. The open concept of the facility allows for greater airflow, reducing cooling costs and increasing the penetration of natural light to offset other light sources. A four-story "living wall" of tropical plants is located in the atrium and cleanses the air of pollutants such as formaldehyde, volatile organic compounds, dust, and spores. Behind the living wall is a running water supply that provides humidity during the winter months and a soothing sound for employees and visitors to enjoy all year round. The historic city hall in Cambridge was built in 1858 by local architect H.B. Sinclair for $3,650, replacing the original structure built in 1838. Built of granite and white limestone, locally-found blue granite was used as a decorative feature. The Historic City served as the community's town hall and marketplace. Today, the Historic City Hall and the New City Hall are connected by a hallway constructed shortly after the New City Hall was built. In the tradition of environmental stewardship, Cambridge preserves over 365 hectares of parkland which make up more than 80 parks in the city, as well as over 140 km of on-road cycling lanes. Cambridge has been characterized by rapid growth in recent years. The population in 2006 was 120,371; by 2011 it was 126,748 and by 2016 it had increased to 129,920. According to an Economic Development estimates, the projected population for 2031 is 180,000. According to the Canada 2006 Census, Cambridge is populated by people of a European ethnic background – 90.2%, mostly those of English (31,400), Scottish (20,625), Irish (19,040), German (14,110), Portuguese (10,685) and French (10,040) origins. Many Newfoundlanders (mostly from the Conception Bay and Bell Island area) have migrated to Cambridge, mostly due to the closure of the iron ore mines on Bell Island. The city is largely Christian at 80.2%, followed by non-religious people who number 15%. Sikhs, Muslims, Hindus and other faiths make a little over 5% of the population. Over the last few years the numbers of Indians, Pakistanis and Afghans moving in from other urban areas or immigrating from their respective countries, has doubled and tripled. Cambridge is also much younger than the national average. 21.6% of the population is under 14 years of age. Only 11% of the population is over 65, resulting in an average age of 35.2, slightly lower than the national average. The car barn for the Galt, Preston, Hespeler and Preston, Berlin railway. A streetcar system, the Galt, Preston and Hespeler electric railway (later called the Grand River Railway Company) also began to operate in 1894, connecting Preston and Galt. In 1911, the line reached Hespeler, Berlin (later called Kitchener) and Waterloo; by 1916 it had been extended to Brantford/Port Dover. The electric rail system ended passenger services in April, 1955. There are two main arterial roads that form an 'X' through the city. The intersecting point is colloquially referred to as the Delta. The Delta is adjacent to a Canadian Pacific Rail spur and the Babcock & Wilcox plant, and at peak rush hour times traffic will back up for miles radiating outwards from the Delta. A number of strategies were investigated to alleviate delays caused by trains and as of December 2012 construction of a bridge over Hespeler Road commenced, and was completed 18 months later. Highway 8 (Ontario) travels through the city as Shantz Hill Road, King Street in Preston, Coronation Boulevard, and Dundas Street, linking Cambridge to Kitchener and Waterloo in the west, and Hamilton in the east. Highway 24 runs through Cambridge as Hespeler Road, Water Street, and Ainslie Street, connecting to Guelph in the northeast and Brantford in the south. Cambridge has some of the most historic bridges in Waterloo Region. The Black Bridge Road Bridge (1916) is Cambridge's only truss bridge and has been designated a heritage site since 1997. It is still driven upon, though it is prone to major flooding and subsequent closure in the spring. The Main Street Bridge (1931) is a bowstring arch bridge made of concrete and is set over the Grand River. Also in Cambridge is the Park Hill Road Bridge (2002), formally known as the Queen Street Bridge (1933). This bridge was one of the three bridges credited with contributing to the development of early Galt. The bridge was reconstructed and widened to four lanes in 2002 retaining much of the original appearance. The Mill Creek Bridge (1837) in Cambridge is the oldest remaining bridge structure in Ontario and one of only two stone masonry arch bridges in the Region of Waterloo. In 2007, the Region of Waterloo completed the first pedestrian/cycling bridge to cross the 401. This bridge connects Morningside Drive (Cambridge) with Doon Valley Drive (Kitchener) and is an integral part of the Grand River Trails. Since 2000, public transport throughout the Region of Waterloo has been provided by Grand River Transit, which was created by a merger of the former Cambridge Transit and Kitchener Transit. GRT operates a number of routes in Cambridge, four of which travel outside of the city: presently the 52, 61, 72, and 111 buses run to southern Kitchener, while the iXpress limited-stop express route runs from the Ainslie St. Transit Terminal through Kitchener to the north end of Waterloo. Intercity service is served by Greyhound Lines, from a terminal near Highway 401 and Hespeler Road. Commuter service to and from Toronto is the key routing, and no local trips are permitted to or from Kitchener. On October 31, 2009, Go Transit started service with a line from Square One shopping centre in Mississauga to the University of Waterloo, therefore allowing a trip to Kitchener from a terminal outside the Wal-Mart Power Centre. Coach Canada run almost every two hours during the daytime between Hamilton and Kitchener, and connecting to Niagara Falls. In June 2011, regional council approved the plan for a light rail transit line from Conestoga Mall in north Waterloo to Fairview Park Mall in south Kitchener, with rapid buses through to Cambridge. In Phase 1, to start operating in 2018, the Ion rapid transit will run between Waterloo and Kitchener, passing through the downtown/uptown areas. Most of the rails had been installed by late 2016 for this Stage 1 service. Stage 2 of the rail line would run from Fairview Mall to the "downtown Galt" area of Cambridge. (At least one journalist has pointed out the similarity between this plan and the electric Grand River Railway of the early 1900s that connected Cambridge, Kitchener, and Waterloo.) Cambridge Mayor Doug Craig was a determined opponent of the plan. He felt that a series of buses would be just as effective but much less expensive. The Ion train service in Kitchener-Waterloo (Stage 1) was expected to begin in late 2017. Most of the rails had been installed by the end of 2016; the maintenance facility and all underground utility work had been completed. The start date of service was postponed to early 2018, however, because of delays in the manufacture and delivery of the vehicles by Bombardier Transportation. As of 24 February 2017, only a single sample of a train car had arrived for testing. In late February 2017, plans for the Stage 2 (Cambridge section) of the Ion rail service were still in the very early stage; public consultations had just started at the time. Some routes and stops had been agreed upon in 2011, but the final plan will not be established until mid 2017. No estimated date has been published for the start of light rail service to Cambridge. Until the completion of Stage 2, rapid transit will be provided between Fairview Park Mall and the Ainslie Street Transit Terminal (in the downtown Galt area) using adapted iXpress buses. Other stops for this Ion bus are at Hespeler Road at the Delta, Can-Amera, Cambridge Centre, Pinebush, and Sportsworld. The rapid transit bus uses bus-only lanes at Pinebush, Munch and Coronation to minimize slowdowns at times of heavy traffic. After the LRT train has started operating in Kitchener-Waterloo, the ION bus will provide a direct link to that system. Although freight trains serving the Toyota factory are a common sight in Cambridge, the city at present has no passenger rail service. The nearest Via Rail stations in the Quebec City-Windsor Corridor are Kitchener station, Guelph station, and Brantford. The most easily accessible GO Transit railway stations are in Kitchener, Guelph and in Milton. GO bus service between Mississauga, Cambridge, and Kitchener was introduced in 2009 as a forerunner to GO train service to Kitchener. Greyhound Lines has been reported to be a major player in the proposed bus links between Cambridge and the GTA. The nearest airport to Cambridge is the Region of Waterloo International Airport in neighboring Breslau, Ontario. While it is a thriving general-aviation field, commercial airlines from this location serve few destinations. On 22 June 2016 American Airlines announced it would be suspending flights to Chicago from this airport effective 5 October 2016. The Galt Arena Gardens, opened in 1922, is the oldest operating arena in Ontario. Cambridge has 365 ha of parkland, 99 parks, over 140 sports fields, and many golf courses. As well, the city has over 70 km of urban and natural trails, 18 km of which run along the Grand and Speed Rivers. Cambridge is the home of the Greater Ontario Junior Hockey League's Cambridge Winterhawks. The Winterhawks have been the winners of the 2006 and 2007 Sutherland Cup. Cambridge also was the home of the four-time Allan Cup winning Cambridge Hornets of the Original OHA Senior A League, the last OHA Senior A Hockey League, and Major League Hockey. The team folded in 2006 after a dispute with the Ontario Hockey Association involving the use of the phrase "get the puck off the ice." As well, the Cambridge Turbos (Girls' Ringette) won the 2009 Tim Hortons Canadian ringette championships held in April in Charlottetown, PEI. The Scorpions Youth Volleyball Club was formed in 2009 and has over 400 youth registered in their indoor and beach volleyball programs. The Scorpions have 8 competitive indoor teams. In September 2012 the Scorpions have the City of Cambridge 1st every boys competitive team (15U team) playing in the Ontario Volleyball Association. The club is a member of the Ontario Volleyball Association, with Learn to Play and House League programs for girls and boys Grades 3–12. They also have one of the largest youth beach volleyball programs in Ontario. The Cambridge Aquajets are a competitive swim team that was founded in the early 1950s. The club practices at all of the City of Cambridge pools throughout the year. Cambridge also has had back-to-back competitive football championships in the "Ontario Varsity Football League". Archived from the original on February 24, 2018. Retrieved November 17, 2018. , "Southwestern Ontario Football Association of Leagues". Archived from the original on August 16, 2011. and the "Ontario Minor Football League". . These Football teams are either named The Cambridge Lions or the Cambridge Wolverines. The outstanding athletic achievement of individuals participating in sports has been honoured in Cambridge every November at the Cambridge Sports Awards banquet since 1974. The Galt Red Wings were a junior ice hockey team based in Galt that played in the Ontario Hockey Association from 1944 to 1947. They were operated as an affiliate of the Detroit Red Wings of the National Hockey League. During the 1944–45 season, the Red Wings were led by Gordie Howe. They reached the league finals for the J. Ross Robertson Cup in 1945, but lost to Toronto St. Michael's Majors in four games. Their home arena was the Galt Arena Gardens. The City of Cambridge has 6 public skating arenas: Dickson Centre, Duncan McIntosh Arena, Galt Arena Gardens, Hespeler Memorial Arena, Karl Homuth Arena, and Preston Auditorium; and 2 private skating areas: Cambridge Ice Centre and Ice Park. As well, the city has 2 public indoor pools (John Dolson Centre and W.G. Johnson Centre) and 3 public outdoor pools (Edward Newland Pool, George Hancock Pool, and Kinsmen – Soper Pool), in addition to the indoor pool at the Chaplin Family YMCA. Cambridge has one lawn bowling club: the Preston Lawn Bowling Club is on Queenston Road in the Preston area of the city. This club is open to the public and caters to all age groups and are members of District 7 of the Ontario Lawn Bowling Association. On October 24, 2008, the city completed the COM DEV Indoor Soccer Park. The $2.8 million project was funded by the City of Cambridge, COM DEV, and the Cambridge Youth Soccer Club, and will help accommodate a large number of kids playing soccer in the Waterloo Region. ^ a b "Cambridge, City Ontario". Census profile, Canada 2016 Census. Statistics Canada. 2016. Retrieved 10 March 2017. ^ "About Cambridge Ontario, Canada". City of Cambridge. City of Cambridge. 2015. Retrieved 20 March 2017. ^ "History, Cambridge Ontario". City of Cambridge. City of Cambridge. 2015. Retrieved 20 March 2017. ^ "History of the Town of Preston:". Cambridge. City of Cambridge. 2011. Retrieved 10 March 2017. ^ Smith, Wm. H. (1846). Smith's Canadian Gazetteer - Statistical and General Information Repecting All Parts of The Upper Province, or Canada West. Toronto: H. & W. Rowsell. p. 62. ^ "Historical Plaques of Waterloo County". Historical Plaques. Wayne Cook. 2014. Archived from the original on March 12, 2017. Retrieved March 10, 2017. ^ "History of Waterloo County". Ancestry. Ontario GenWeb. 2014. Retrieved 20 March 2017. ^ Mills, Rych (13 February 2017). "Growing Galt makes a grand view". Record. Kitchener. Retrieved 10 March 2017. ^ Mills, Rych (23 November 2018). "Flash from the Past: Hospitals' history of growth a Cambridge-Galt". Record. Retrieved 25 November 2018. ^ a b c d e "Cambridge and its Influence on Waterloo Region's Light Rail Transit". Waterloo Region. Waterloo Region. 19 January 2017. Retrieved 10 March 2017. ^ a b c Mills, Rych (10 January 2017). "Flash From the Past: Preston Car and Coach goes up in smoke". Record. Kitchener. Retrieved 10 March 2017. ^ "Waterloo Region 1911". Waterloo Region WWI. University of Waterloo. 2015. Retrieved 20 March 2017. ^ Martin, Ran (8 May 2014). "One Day in May event marks 1974 flood's 40th anniversary". Cambridge Times. Cambridge, Ontario. Retrieved 10 March 2017. ^ Swayze, Kevin (14 May 2015). "May 1974: Cambridge flood damage runs into 'many millions' - Looters charged by police". Record. Kitchener, Ontario. Retrieved 10 March 2017. ^ "Historical Information - Evolution of Preston". Archived from the original on February 12, 2010. Retrieved May 14, 2010. ^ Mills, Rych (9 May 2015). "Flash From the Past: Trailblazers nostalgia behind Preston's name". Record. Kitchener. Retrieved 10 March 2017. ^ Smith, Wm. H. (1846). Smith's Canadian Gazetteer - Statistical and General Information Respecting All Parts of The Upper Province, or Canada West. Toronto: H. & W. Rowsell. p. 8. ^ a b Mills, Rych (10 January 2017). "Flash From the Past: Preston Car and Coach goes up in smoke". Record. Kitchener. Retrieved 10 March 2017. ^ Mills, Rych (6 March 2016). "Flash From the Past: Preston Car and Coach goes up in smoke". Record. Kitchener. Retrieved 10 March 2017. ^ Rych Mills (5 October 2018). "Flash from the Past: Pampering people at Preston Springs". Waterloo Region Record. Retrieved 7 October 2018. ^ Ray Martin (5 June 2018). "Cambridge council moves to have Preston Springs secured". Waterloo Region Record. Retrieved 7 October 2018. ^ "Preston - Previous Names: Cambridge Mills, East Preston". Region Museum. Waterloo Region. 2011. Retrieved 10 March 2017. ^ "History". Cambridge. City of Cambridge. 2011. Retrieved 10 March 2017. ^ "History, Hespeler". City of Cambridge. City of Cambridge. 2015. Retrieved 22 March 2017. ^ Smith, Wm. H. (1846). Smith's Canadian Gazeteer - Statistical and General Information Respecting All Parts of the Upper Province, or Canada West. Toronto: H. & W. Rowsell. p. 136. ^ "SW-Ontario-Counties_e010780571" (PDF). p. 151. Retrieved 10 November 2018. ^ County of Waterloo Gazetteer and General Business Directory, For 1864 (PDF). Mitchell & Co. 1864. p. 150. ^ "Brief History of the Community of Hespeler". Cambridgeweb. Cambridge Web. 2009. Retrieved 10 March 2017. ^ "Item 1989-1 48 - First death (1804) and burial in the Mennonite". Mennonite Archival Image Database. Retrieved 11 November 2018. ^ "Blair Cemetery". Find A Grave. Retrieved 11 November 2018. ^ Thompson, Catherine (31 January 2016). "Mennonite cemetery offers glimpse into Kitchener's earliest days". Metroland Media Group Ltd. Retrieved 11 November 2018. ^ "Sheave Tower, Blair". Waterloo Insider. Waterloo Insider. 2011. Retrieved 10 March 2017. ^ "History of Blair". Cambridge. City of Cambridge. 2011. Retrieved 10 March 2017. ^ County of Waterloo Gazetteer and General Business Directory, For 1864 (PDF). Mitchell & Co. 1864. ^ "Official Plan, Blair Village" (PDF). Cambridge. City of Cambridge. 1999. Retrieved 10 March 2017. ^ "Meet Ken Seiling". Region of Waterloo. Archived from the original on August 8, 2017. Retrieved July 29, 2017. ^ "Regional Council - Region of Waterloo". Region of Waterloo. Archived from the original on July 9, 2011. Retrieved July 4, 2011. ^ "Flash from the Past: Hospitals' history of growth a Cambridge-Galt constant". Waterloo Region Record. 23 November 2018. Retrieved 30 December 2018. ^ "Who We Are". CMH. 26 October 2013. Retrieved 30 December 2018. ^ "Cambridge Galt MOE, Ontario". Canadian Climate Normals 1981−2010. Environment Canada. Retrieved September 15, 2013. ^ "Cambridge Industries". City of Cambridge. Archived from the original on July 6, 2013. Retrieved July 19, 2013. ^ a b c Latif, Anam (16 August 2017). "Cambridge becoming a 'film-friendly' city". therecord.com. Metroland Media Group Ltd. Retrieved 11 November 2018. ^ "Filming Location Matching "Cambridge, Ontario, Canada" (Sorted by Popularity Ascending)". IMDb.com, Inc. Retrieved 10 November 2018. ^ "Conestoga College Officially Takes Ownership of" (PDF). The City of Cambridge. October 22, 2008. Archived from the original (PDF) on October 1, 2011. Retrieved September 6, 2011. ^ a b c Latif, Anam. "Old post office project takes shape in Cambridge". therecord.com. 14 September 2017: Metroland Media Group Ltd. Retrieved 11 November 2018. ^ a b "Lights, Curtain, Action! Grand Opening of Dunfield Theatre Cambridge". Government of Canada - Infrastructure Canada. 8 March 2013. Retrieved 11 November 2018. ^ Latif, Anam (12 July 2017). "Dunfield Theatre Cambridge's name change a family affair". Metroland Media Group Ltd. Retrieved 11 November 2018. ^ Cambridge ON ethnicity data from Statistics Canada See also Karen Dearlove, "Diaspora and Community Building: The Portuguese in Cambridge, Ontario," paper presented to the Narrating the Portuguese Diaspora International Conference on Storytelling, Lisbon University, October 2008. ^ Karen Dearlove, "(Im)migration and Community Building: Newfoundlanders in Cambridge, Ontario," paper presented at the Annual Meeting of the Canadian Historical Association, York University, May 2006. ^ "CAMBRIDGE AND ITS INFLUENCE ON WATERLOO REGION'S LIGHT RAIL TRANSIT". Waterloo Region. Waterloo Region. 19 January 2017. Retrieved 10 March 2017. ^ "Rail plan passes". TheRecord. 2011-06-15. Retrieved 2012-02-20. ^ "CAMBRIDGE AND ITS INFLUENCE ON WATERLOO REGION'S LIGHT RAIL TRANSIT". Waterloo Region. Waterloo Region. 19 January 2017. Retrieved 10 March 2017. the first electric line running up Water and King Streets from Galt to the Mineral Springs Hotel across the Speed River in Preston ... Next, the train line extended north of Kitchener and a spur line ran into Hespeler. ^ Ray Martin (2013-11-19). "Mayor wants Cambridge exempt from paying for Light Rail Transit in Kitchener, Waterloo". Kitchener-Waterloo Record. Archived from the original on 2014-10-11. Retrieved 2013-11-20. While Waterloo Region has promised to bring light rail transit to Cambridge in the second phase of its development, no one can say for sure when that will be. ^ "Cambridge mayor wants to look at cost of cancelling LRT: Doug Craig favours bus rapid transit". CBC News. 2013-08-20. Retrieved 2013-09-16. While Craig called for examining the cost of the potential cancellation of the LRT, he stopped short of providing what would constitute a reasonable price tag, saying instead that he believed the region could easily opt out of its current plan in favour of something else, even though construction on light rail had already started. ^ "Waterloo Region's Rapid Transit System to Shape Growth, Development". Metro Magazine. October 13, 2014. Retrieved 2014-10-25. ^ Desmond, Paige (23 December 2016). "LRT construction 90 per cent complete". Waterloo Region Record. Retrieved 25 March 2017. ^ Flanagan, Ryan (24 February 2017). "Bombardier '100% committed' to delivering Ion vehicles by end of 2017". CTV News. Bell Media. Retrieved 24 March 2017. ^ Sharkey, Jackie (8 February 2017). "There's still wiggle room in the Region of Waterloo's LRT plans for Cambridge". CBC. CBC. Retrieved 10 March 2017. ^ Sharkey, Jackie (February 2017). "Stage 2 ION: Light Rail Transit (LRT)" (PDF). Region of Waterloo. Region of Waterloo. Retrieved 24 March 2017. ^ "RAPID TRANSIT ENVIRONMENTAL ASSESSMENT PHASE 2, STEP 3b – PREFERRED RAPID TRANSIT SYSTEM OPTION AND STAGING PLAN" (PDF). Retrieved 9 April 2015. ^ "ION Bus Rapid Transit - Frequently Asked Questions". Archived from the original on March 25, 2017. Retrieved March 24, 2017. ^ The Record (22 June 2016). "American Airlines pulls twice daily flights to Chicago from local airport". Metroland Media. Retrieved 22 June 2016. ^ "Scorpions Volleyball is a Hit in Cambridge". ^ "Chaplin Family Y". Retrieved June 3, 2011. ^ "OBLA District 7". Retrieved June 3, 2011. Wikimedia Commons has media related to Cambridge, Ontario.